While Savino doesn’t yet know all of the details about the Science Undergraduate Laboratory Internship, he said he’ll be “doing material testing with interferometry.” Interferometry has been defined as “a series of techniques that uses a series of superimposed electromagnetic waves to extract data and other insights regarding the waves.” It’s used in fiber optics, seismology, astronomy, nuclear physics, and other fields. “I’m just excited to go and work with the other interns and the other scientists there,” he said. 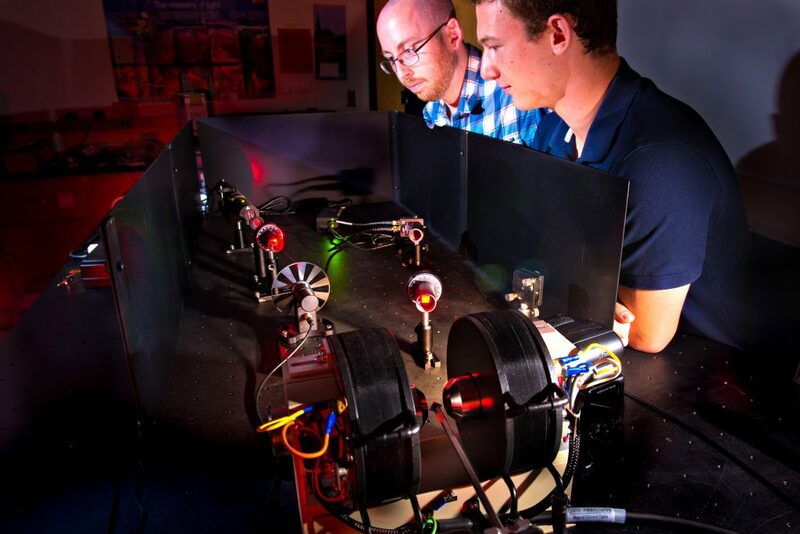 Dr. William Roach (left) and Nick Savino (right) in the lab last summer, doing research involving the Magneto-Optic Kerr Effect. In addition to his bachelor’s degree in physics, when he graduates in 2019 Savino will have minors in mathematics, history, and business. He’s also captain of Lynchburg’s varsity tennis team. To learn more about Savino and his University of Lynchburg experience, watch this video.